Hail and well met! We are the Figures in the Fog and today we’ll be reviewing the new cards for Ashes: Rise of the Phoenixborn, added in The Ghost Guardian . This is the second entry in this series, so if you haven’t read our first article, you can catch up here: http://www.strangecopy.com/index.php/2018/09/16/figures-in-the-fog-review-rimea-careworn/. However, time waits for no one, as several of cards we’re reviewing today would tell you. Unwilling to be upset by Xander, Rimea is introducing 1 Ready Spell, 3 Conjurations, and 2 Allies. 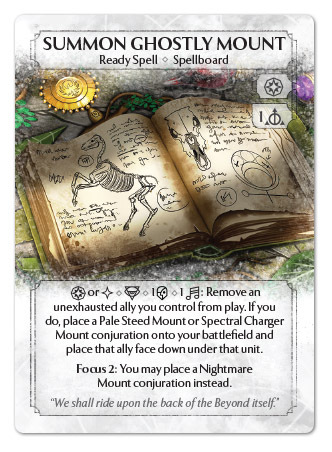 Moving right along, the first card to cover today, is a Ready Spell called Summon Ghostly Mount. 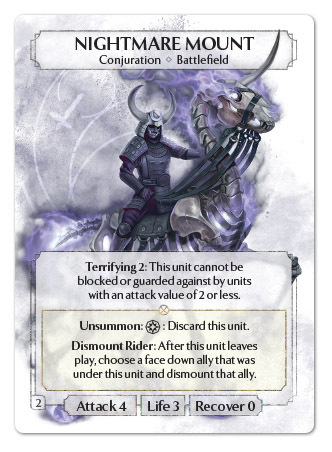 Summon Ghostly Mount costs a basic die and a Main Action to play, and EITHER a Main Action or a Side Action, and an Illusion class die and a Sympathy class die to activate. Once activated, the controlling player has 2 different Conjurations that they can choose to summon, Pale Steed Mount or Spectral Charger Mount. And once they get Focus 2 online, there’s a third Conjuration summon they could summon, called Nightmare Mount. The first base Conjuration, Pale Steed Mount is a 2 Attack, 4 Life, 0 Recover Conjuration with 3 Abilities. The first and only unique Ability is Unit Guard. 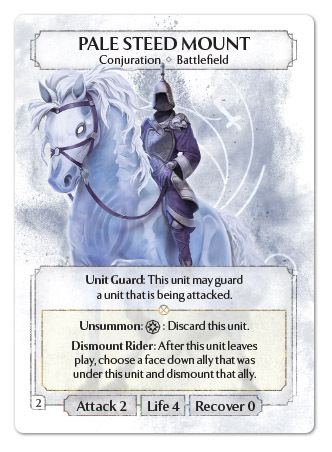 Unit Guard is an ability from the base set, that allows Pale Steed Mount to guard other Units, when they are declared as the subject of an Atttack. The second ability and third abilities, Unsummon and Dismount Rider are shared amongst the 3 Conjurations, so for brevity, let’s hold onto that until the end. The second base Conjuration is a 3 Attack, 2 Life, 0 Recover Conjuration with 3 Abilities, called Spectral Charger Mount. The Spectral Charger Mount’s unique Ability is Battle Advantage. 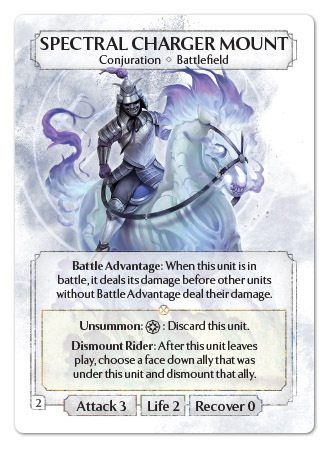 Battle Advantage is also an ability from the base set, that means that in combat Spectral Charger Mount deals damage first. For example, if a Spectral Charger Mount attacks an enemy Hammer Knight, due to Battle Advantage, the Hammer Knight is destroyed before it can deal damage and trigger Aftershock. The final and most powerful of the Conjurations from the Summon Ghostly Mount Ready Spell is the Nightmare Mount. Nightmare Mount boasts an impressive 4 Attack, 3 Life, 0 Recover, and 3 Abilities, including Terrifying 2. Terrifying, unlike the other two, is a relatively new ability, requiring an enemy Unit to have at greater than the associated number to block or guard against the Nightmare Mount. The second ability of all three Conjurations is an inexhaustible Ability called Unsummon. Unsummon costs a Main Action to activate and immediately discards the Unit. Dismount Rider is another inexhaustible Ability that triggers whenever one of the Mounts leaves play. The Ally placed underneath the Mount enters play with an exhaustion token. After the Ally enters play, the controlling player may place 1 wound on that Unit to remove the exhaustion token. The first thing that stands out about Summon Ghostly Mount is its inherent flexibility. The alternative activation cost of either a Main Action or a Side Action is already huge, especially in magic types that tend to rely on Side Actions, like Illusion and Sympathy. And then there’s the 3 different Conjurations available from a single spell. The benefit of this flexibility is that the controlling player can choose the best Conjuration for the given situation. If they need a strong defensive Unit, they can summon Pale Steed Mount. If they need to threaten trades on the board, they can summon Spectral Charger Mount. And if they need to swing in or bypass a weak but crowded field, they can summon the Nightmare Mount. X: This card is insanely flexible! Unfortunately, there are some serious requirements for enabling this flexibility. It requires both Illusion and Sympathy magic to use, and requires several Allies in order to have reliable use of this spell. This greatly limits the type of decks that could possibly get value out of this card. One of the best synergies I can see from this card are pairing with String Mage, to pull double duty from the Mount Conjuration and the wound from Dismount Rider, due to Exchange Link. Alternatively, I think it pairs very well with Beast Mage. You can use the Mount to protect the Beast Mage when it’s your turn and it’s weak, and swing in when it’s strong and Terrifying. N: I feel like I’m most likely to run this is ground based swing decks. You need a pretty decent ally base to support mounts, and I think conjurations are still best in the stall based deck. Instead, this will need to be used to shift from aggressive to defensive in a ground war based on the board state. Looking forward to playing with this card. The first Ally Rimea is bringing to the game is called the Battle Seer. Battle Seer joins the ranks of powerful 3 cost Allies like Beast Mage, Celestial Knight, Hammer Knight, River Skald, and Sonic Swordsman, costing an Illusion power die, a sympathy class die, and a basic and a Main Action. Battle Seer has 3 Attack, 3 Life, 1 Recover and a new exhaustible ability called Battle Trance. 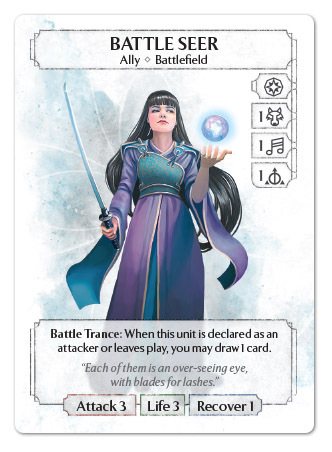 Battle Trance triggers when Battle Seer is declared as an attacker, and when she leaves play, and allows the controlling player to draw 1 card from their draw pile. This card is sending some very interesting signals. At 3 dice cost, including a power symbol, and a class symbol of different magic types, the comparisons to Hammer Knight, and Sonic Swordsman are unavoidable. Like those Allies, this card has great stats, but unlike those Units, Battle Seer’s ability doesn’t add to it’s offensive capabilities. Fortunately, decks that include Illusion and Sympathy have ways of getting value out of drawing a card. The most infamous Illusion Phoenixborn, Victoria, loves few things more than drawing into another Illusionary Cycle. Additionally, there are several Sympathy cards that benefit from drawing cards, including River Skald, Squall Stallion, and Sonic Swordsman. X: I can’t wait to get my hands on this card! As many of you know, Squall Stallions are one of my favorite cards in the game, and anything that could help to make Squall Stallions relevant gets a pass in my book. The fact that it also easily enables getting at least two triggers off of Opportunist, due to the number of Side Action draws in the game now, due to Changing Winds and Hand Tricks. But by far my favorite interaction with this card is the synergy with River Skald. With only these two Allies, you can declare both Units as attacking, trigger Battle Trance, draw a card, trigger Harsh Melody, and then finish the attack with both Units. N: Well I’m hoping this isn’t the final printed version of these cards, because as is, it has the same problem as Sun Sister that needed to be fixed in the most recent FAQ. Also an additional interesting comparison to the Aftershock Bros. mentioned above, Battle Seer is a little more resistant to Regress as her ability doesn’t require dealing damage to trigger. Altogether, I really like this card. I’ve always wanted Squall Stallion Coal to be a machine, using the craw draw to feed the Slash machine gun. I’m really hoping this additional will push the deck into competitive viability which it has always just felt a little shy of. The final card for today is another Ally called Hollow. Hollow is a 2 Attack, 1 Life, 0 Recover Ally with 2 different abilities, for the low low cost of a Main Action and either an Illusion class or a Sympathy class die. This is the exact statline of another Ally, Psychic Vampire, with a slightly lower cost and an alternative cost. The first ability of Hollow is an exhaustible Ability called Possession. 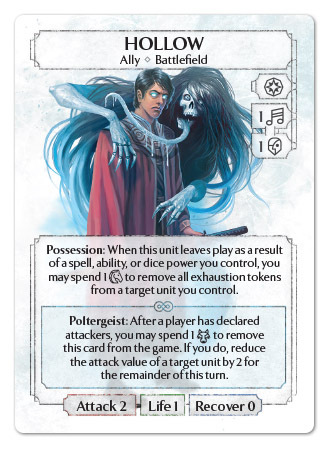 Possession can trigger whenever Hollow leaves play, then the controlling player may pay a Sympathy power die to removal all exhaustion tokens from a target Unit. The other Ability Hollow has is a Between Realms ability, called Poltergeist. Poltergeist can be triggered whenever an opponent declares attackers for an Attack a Unit or Attack a Phoenixborn Main Action. If Hollow is in the defending player’s hand or discard pile, they may pay an Illusion power die and then remove Hollow from the game to reduce a target Unit’s Attack by 2. Much like Summon Spectral Mount, this card is incredibly flexible! The alternative cost of either an Illusion class die or a Sympathy class die, greatly increases the types of deck that Hollow might be seen in. However, unlike Summon Spectral Mount, this cards flexibility comes with a very substantial drawback. Due to the cost of Hollow’s abilities, it’s forms of functionality are limited by the types of dice available. So in order to get the most of a Hollow, the player will have to utilize both Illusion magic and Sympathy magic, or risk only being able to trigger Possession or Poltergeist. This could potentially reduce the types of decks Hollow could be used in, effectively reducing the benefits of the alternative cost. X: I am definitely looking forward to deckbuilding with this card! I also like that it’s an offensive Illusion Unit that may actually see some serious constructed play, unlike Flash Archer and Rose Fire Dancer. I’m not certain how often the Abilities will be useful, but I think the stats alone are worth including it. That being said, I think that an opponent showing Illusion power dice is even more threatening. With a single Illusion power symbol, they can threaten to take one of your dice, counter one of your spells or abilities that target Units, and now threaten to shrink one of your attacking Units. N: I like this card. Dirt cheap 2-1 ally, with some funky abilities. I don’t think it’s anything to deck build around, but it gives Sympathy/Illusion decks an inexpensive little ally with some tricks up its sleeves. Thank you for joining us, as we were able to lift the veil and reveal some of our ghostly neighbors today. According to our sources on the other side, PHG should be revealing more of Rimea’s repertoire this Thursday. But what do you think of the new spiritual manifestations? What do you think of the new mount mechanic? Tell us about it in the comments below. And while there is much more we would like to tell you, the veil is falling upon us now, and we must Fade Away. But the Figures in the Fog will return soon with more Ashes content! Great article as always, i really like the analysis and the subjective feedback from players. But I’m confused about the Hollow ally : it is said in the article that Possession triggers whenever the ally leaves play but it misses the part that the controlling player must have caused the ally to leave play (by a spell, dice power or ability), therefore it can’t be trigger if the opponent kills him or if you choose to attack with it and it dies from its wounds. Also, for Poltergeist, it’s important to know that this also works when you choose to attack on your turn. Now, I’m waiting for the next articles on this week’s previews.